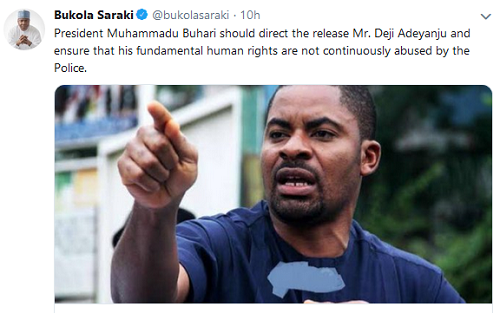 Senate President, Bukola Saraki has asked President Buhari to intervene in the detention of young activist, Deji Adeyanju by making sure his rights are not been trampled upon. 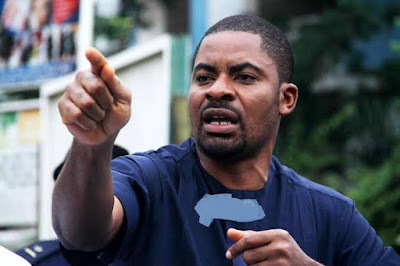 ''President Muhammadu Buhari should direct the release Mr. Deji Adeyanju and ensure that his fundamental human rights are not continuously abused by the Police. ''The way Mr. Adeyanju’s case has been handled and the last decision of the Magistrate Court to remand the young man in prison till after the conclusion of the 2019 Polls has presented our democracy in bad light. ''The President needs to intervene to find out whether the current travails of Mr. Adeyanju have anything to do with his frequently expressed viewpoints against the Federal Government. ''At this point, President Buhari should not allow the excesses and over-zealousness of some security agents to give his government a bad name. ''I also call on all human rights protection groups to wade into this matter and ensure that we do not watch helplessly as the rights of a citizen is being trampled upon.